if you have message like this when you starting sql server service on your computer, its mean, your database ‘master’ on your sql server. is corrupted. 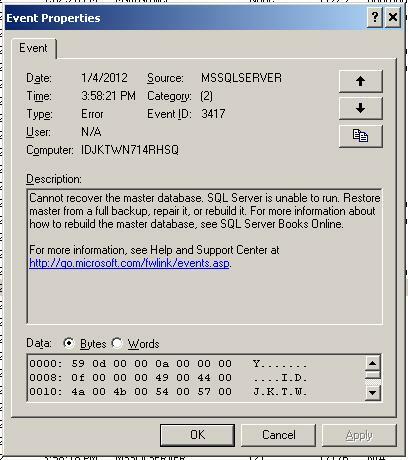 You can check this message in event viewer its mean you need to recover your database master. this comman will rebuild your database master. after this process, try to running the sql server service, and your service will be running well. but your database will gone after you done this process. Do not panic, because the actual database (.mdf file) still on your computer. You just need to attached the database to your engine.